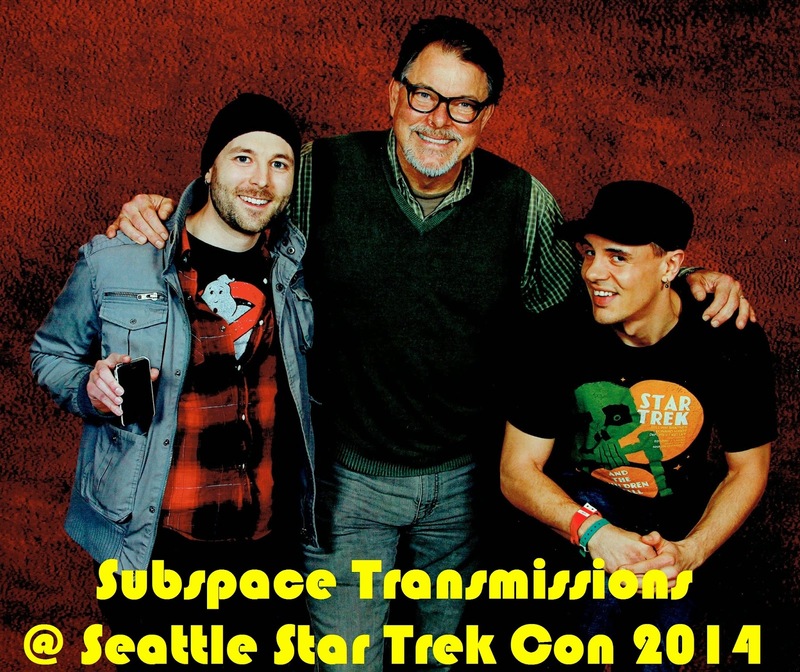 Subspace Transmissions: A Star Trek Podcast: BONUS EPISODE - "SEATTLE STAR TREK CON 2014 MEMORIES"
BONUS EPISODE - "SEATTLE STAR TREK CON 2014 MEMORIES"
In this very special away team report, hosts Cam Smith and Tyler Orton, with added input from a surprise voice from the past, break down all three days of Creation's 2014 Seattle Star Trek Convention. Which panels were the best? How were the merch bargains? What was Marina Sirtis' most outrageous moment? All these fundamental questions are answered, as well as an explanation for the tremendously awkward Jonathan Frakes photo above, a still unconfirmed brush with natural disaster and a noticeable drop in sophistication and clarity by con's end. Consider yourselves forewarned. Wanna appear on the show? Shoot us a 30 to 60-second audio clip telling us what your FAVORITE SEATTLE STAR TREK CON 2014 MEMORIES were and you could take the spotlight in an upcoming program! You can also send any other questions, topic ideas or feedback to subspacetransmissionspod@gmail.com! EPISODE 26 - "COOLEST STARSHIPS"
EPISODE 25 - "THE BEST OF PICARD"